JK TOP Floodlights are typically placed on the exterior of buildings or in outdoor spaces such as small sports fields and big stadiums optional controlled wit DALI. This can be done to improve visibility and to promote better safety and security. They can be widely used for domestic and commercial perfect for each of these reasons. A floodlight creates a large beam of light which can be run constantly or via a motion sensors. Helps you to save energy and act as a deterrent to potential thieves and trespassers on private property. Our Floodlights and Stadium Floodlights are designed to be robust and bright and most commonly seen in a bright white light. JK TOP,s diverse range contains floodlights for professional, like Stadium, Parking Lots and lots of other domestic settings. Available product range from portable floodlights to commercial flood lighting. As well as security lights with PIR sensors for motion detection in the dark and here for extra security. RGB colour changing floodlights for outdoor events and to add some daring style to your interior design. 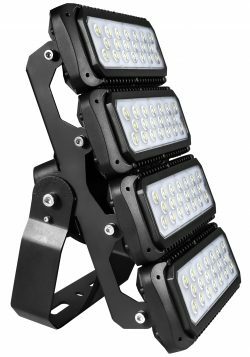 Our multiple floodlights are generally used in contexts where horizontal surfaces. Like (streets, squares and car parks) and vertical surfaces (facades, monuments and architectural features) need to be lit simultaneously. This is why these luminaires feature double adjustability and versatile installation to ensure they can be adapted easily and professionally. A wide range of street and asymmetric optics and accessories ensure superior efficiency. Chromatic quality, glare control and smart system management are all guaranteed. DALI www.dali-ag.org stands for Digital Addressable Lighting Interface and is a protocol set out in the technical standard IEC 62386. We use DALI LED Driver from Inventronic. 1–10 V dimming is one of the earliest and simplest electronic lighting control signaling systems. The control signal is a DC voltage that varies between one and ten volts. Dimming also available based on Zigbee solutions and or DALI. Warehouses, Production, Logistics halls, Retail stores, Theme restaurants, Amusement parks. Indoor , Outdoor Stadiums, Public places, all kind of other industrial and commercial lighting purposes.